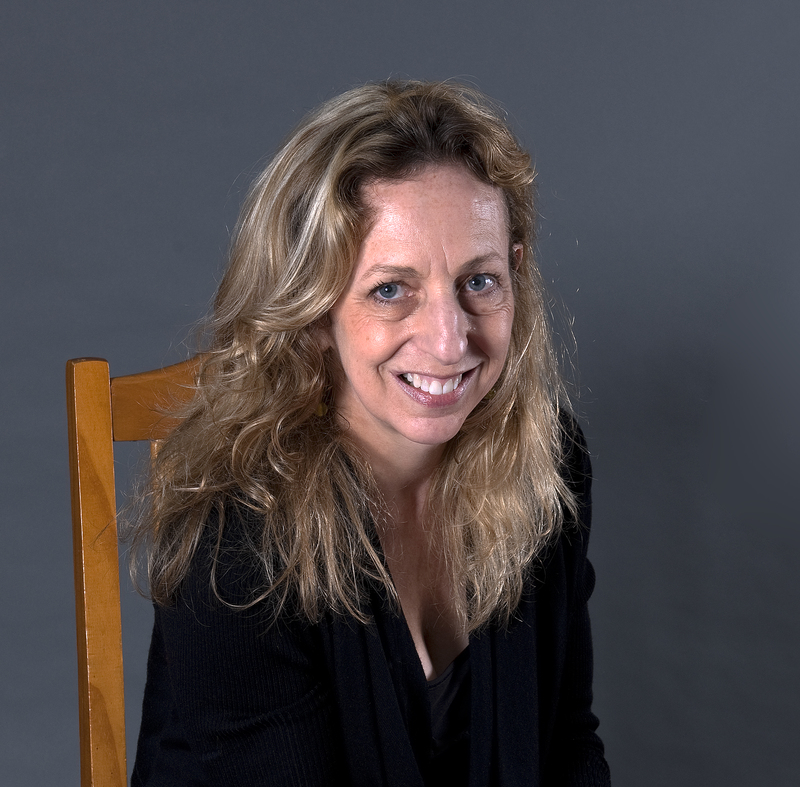 Anna Boothe is the Director of Glass at the National Liberty Museum in Philadelphia. She earned a BFA in sculpture from Rhode Island School of Design and a MFA in glass from Tyler School of Art, where she was a Glass Program faculty member for 16 years. From 2004-2007 she coordinated and helped to institute the Glass Art Program at Salem Community College (NJ). Boothe has been a visiting artist/instructor at numerous schools, some that include RISD, RIT, VCU, UArts, UW (Madison), Sheridan College (Toronto) and Aichi University (Japan), as well as at Pilchuck, Urban Glass, the Studio of the Corning Museum of Glass and schools in Belgium, Switzerland and Turkey. 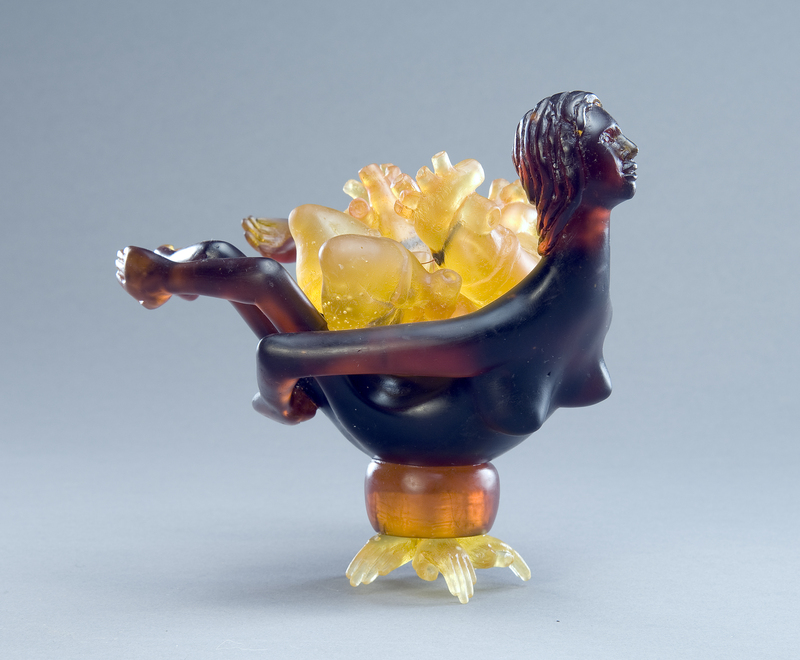 Her sculpture has been shown at the Tittot Glass Art Museum (Taiwan), Bergstrom-Mahler Museum (WI), Kentucky Museum of Art and Design, Nicolaysen Art Museum (WY), Missoula Museum of the Arts (MT) and the Museum of American Glass (NJ) and is included in the collections of the Corning Museum of Glass and the Tacoma Museum of Art. 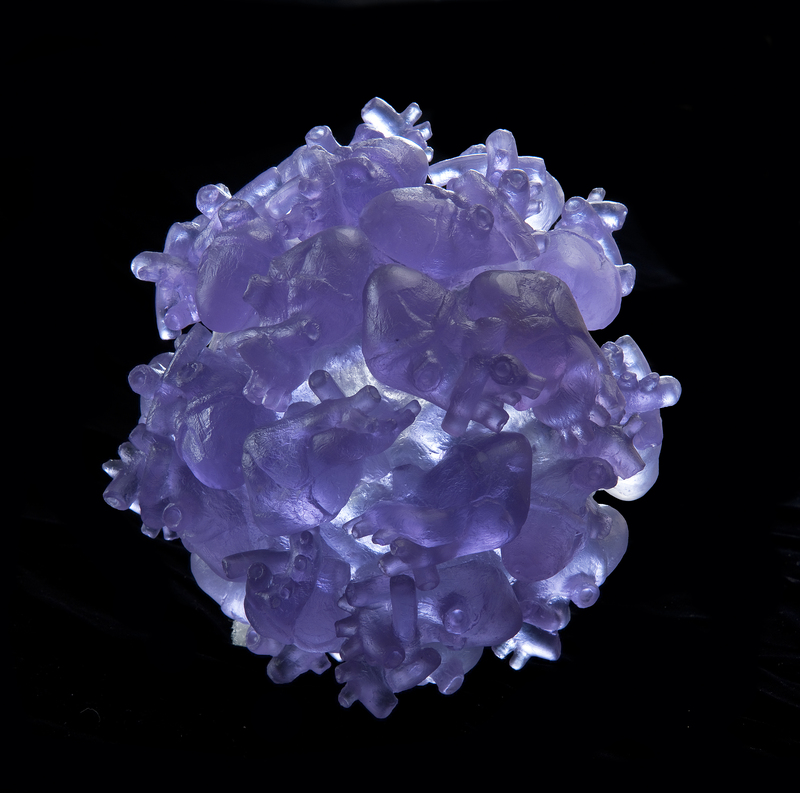 With sculptor Nancy Cohen, she received a collaborative residency at the Studio of CMOG in 2012, work from which was installed at the Accola-Griefen Gallery in Manhattan in 2013. 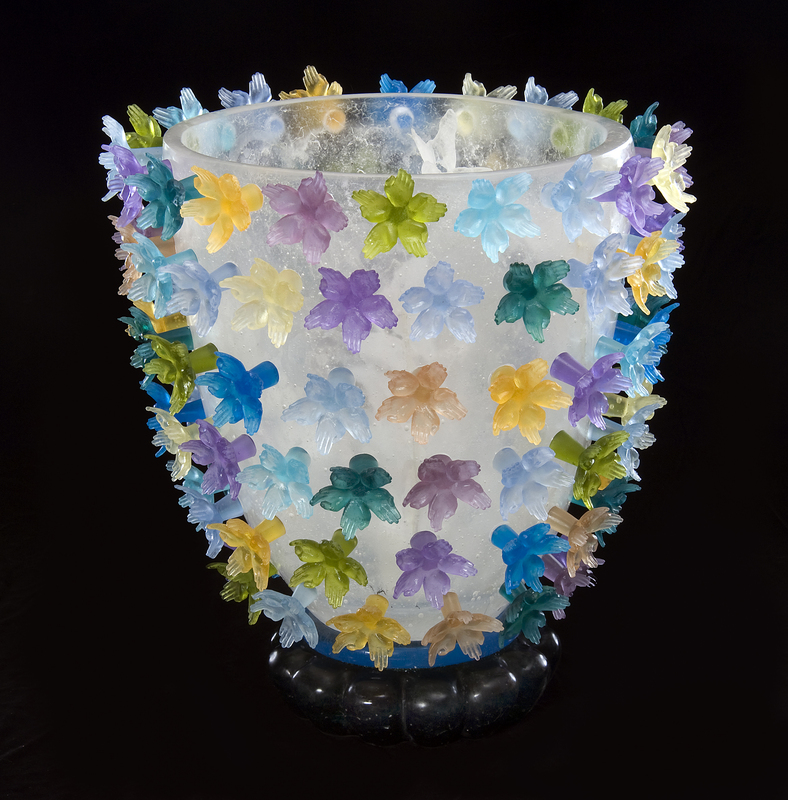 An eight-year Board member of the Glass Art Society, Boothe served as its President from 2004-2006. I’m 55, and with my husband of 30 years have a 22 year-old son who’s in college. We live rurally NW of Philadelphia where we’ve been renovating a 1860s house and barn (my studio) for a long time and where we spend summers growing much of our food. 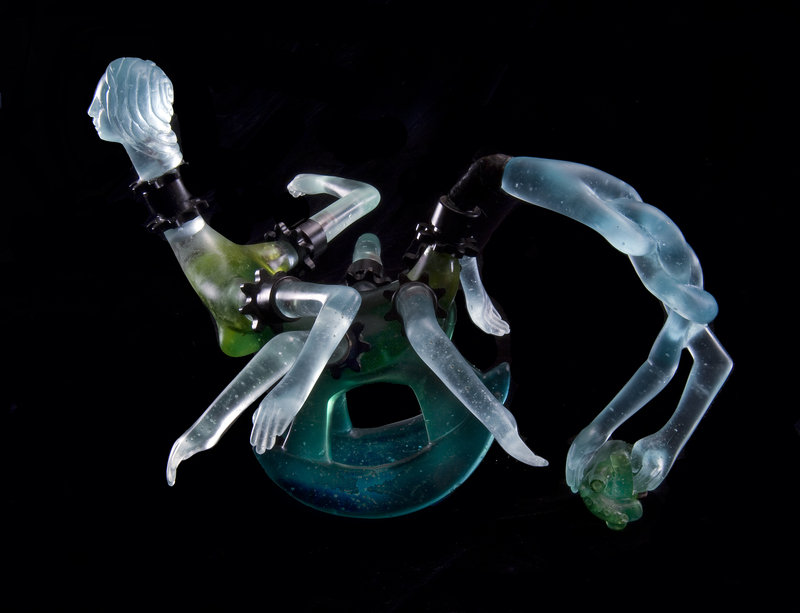 Artistically, I’m a sculptor who has worked primarily with glass for 30+ years. Before becoming smitten by the glass bug, I made sculpture from bread that I either baked in a foundry oven or purchased in ready-made forms (hot dog rolls) and assembled into large structures. When I was in my 20s and 30s, my income came from being a pastry chef at up-scale restaurants and subsequently a cake decorator/sculptor/illustrator. In retrospect, kiln-casting – the primary glassworking process I use – is just another form of baking. The wax I carve to create my positive forms are like chocolate, the molds I fabricate look like cakes and the glass pastes I often fill them with are icing or candy-like. Growing up, I was strongly influenced by my father who, by avocation, was an Egyptologist and filled our home with statuary and a library chock full of art and history books. My mother was a wonderful cook and “crafter,” and to this day, has a prodigious sense of color and design (that I readily tap), as did all of the women in her North Carolina-rooted family. Presently, I divide my time between making my own work – one-of-a-kind sculpture and decorative objects, doing glass fabrication commissions, traveling to teach workshops and focusing on my new museum director’s position in Philadelphia. Over the years my inspiration has come from a variety of sources, but all have related to an investigation of the self and the creation of objects that symbolize or speak to how we reconcile our internal with our external lives. 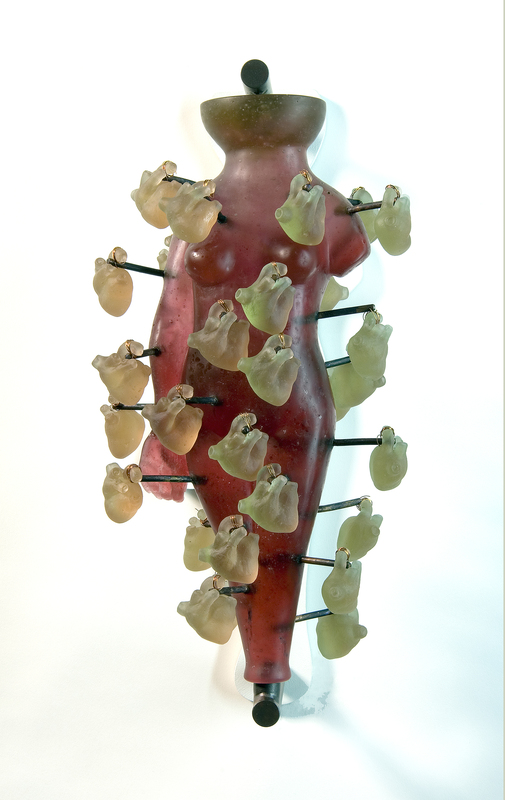 Most of the work I made from graduate school up until about 7 years ago focused on augmenting the female form with tool-like or other appendages in an effort to imbue the figures with specific capabilities (visually-imaged, obviously). My intent was to create metaphors for different sorts of personal improvement – i.e. ways I wanted to grow myself. To this end, my figures became rockets, nails, instruments, bells, keys and garden implements. 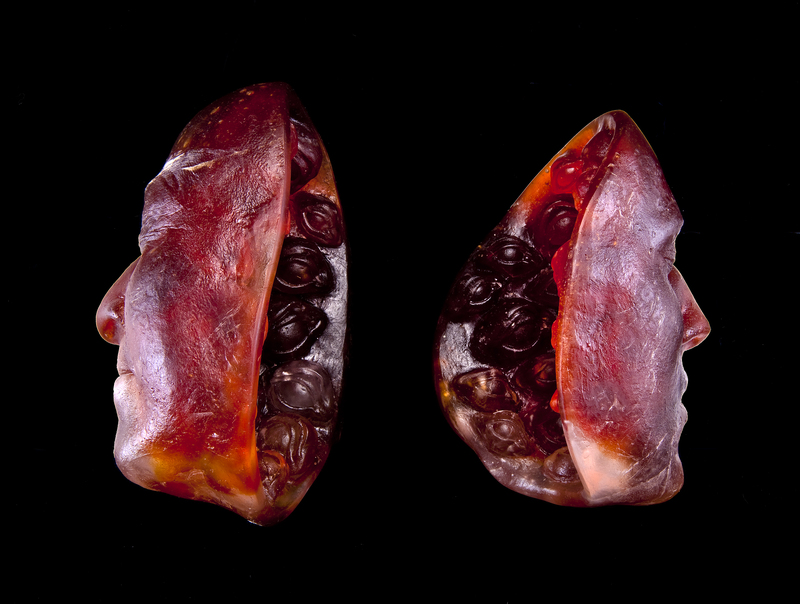 Some grew from rocks; some sprouted semi-precious stones from their feet, crotches and backs. Others sported vertically or horizontally hollowed-out cores in an effort to address self as a conduit and explore the question: Where do our thoughts and inspirations originate? 4) Augmentation: What kind of prostheses or wearable corrective devices might be appropriate for directing certain ways of thinking, etc.? My all-time favorite work is “Growth.” For me, it embodies a state of pure inner quietude. 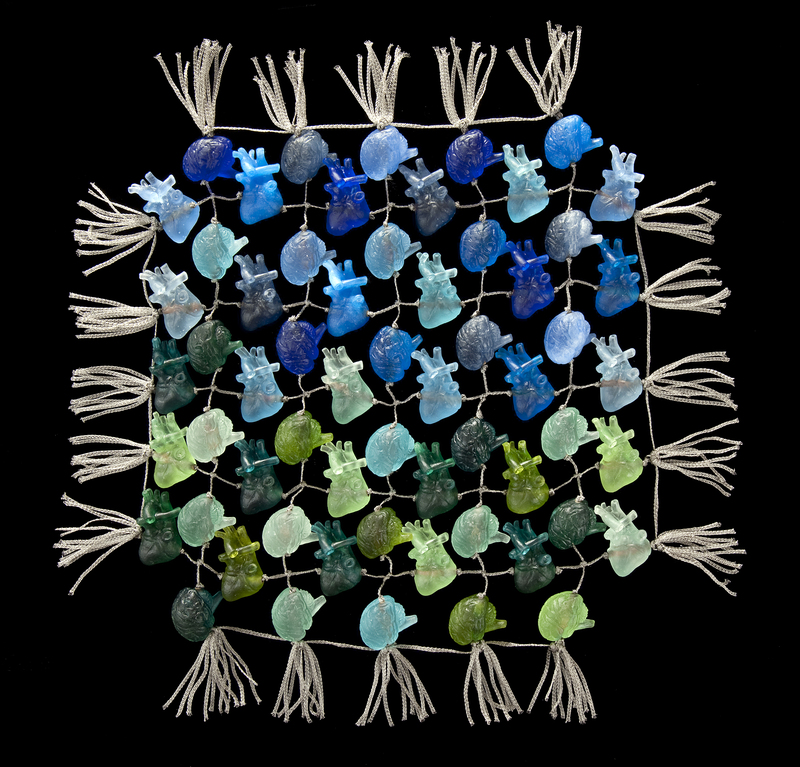 “Sure-Footing,” even though it’s now several years old, is a rug made from large glass heart and brain “beads.” This piece relates directly to my yoga practice and exercises I (try to) do on a “Bosu” or inflated half-ball. It refers to the cultivation of core strength, balance and patience in preparation for facing challenging situations. 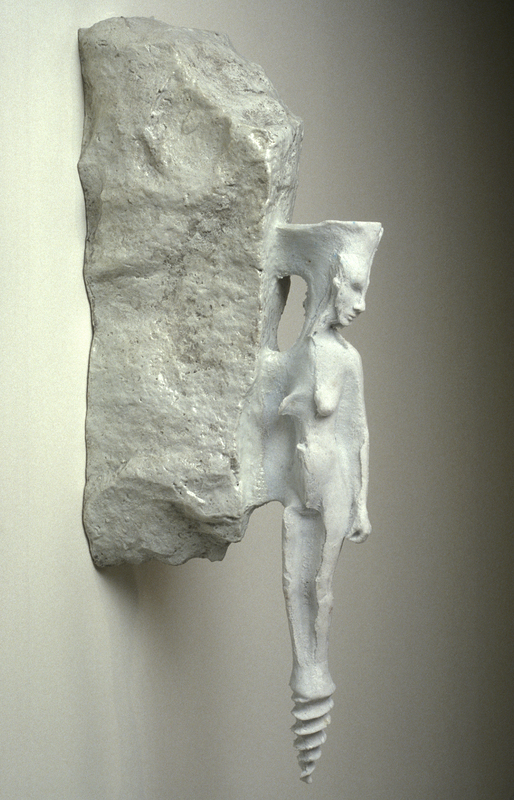 “Between Seeing and Knowing,” is a recent project I did collaboratively with sculptor Nancy Cohen. I will refer to it later in the interview. What do you want to say through your artwork? I hope to convey a sense of humility and compassion as well as to encourage self-reflection in the viewers of my work. You have worked with glass for 30 years – which part of glass fascinates you to keep working with it? Frankly, glass is simultaneously the quintessential humbling and humiliating factor in my life. Working with the material is like having a relationship with another person. Conceptually, and technically (or tactically) it demands a deep respect, unfettered commitment, and undying focus if it is going to “work.” There is no other substance that tests my patience, and thus teaches me patience, the way glass does! What quality do I love most? – its ability to hold light and glow from within. The best part about being an artist, no matter what gender, is knowing that through my work I have an outlet to express myself in a way that is challenging, rejuvenating and satisfying. As an artist I feel free of limitations, even though realistically there are always limits. As mentioned, much of my past work features or builds on the female form, primarily because that’s what I know best; it’s what I see in the mirror. Some sculptures can be construed to address women’s issues, but most just refer to human commonality. I hope that the way I address my subject matter will resonate with experiences others have had, without the need for a gender tag. What is the most difficult thing about being a female artist? I don’t experience any particular difficulty, now. On past occasions, being described or labeled as a feminist artist due to the way I portrayed the female form, although sometimes accurate, often felt dismissive. So, I began editing the figure out of my work and since then I think my sculpture has become stronger and better-addresses my subject matter. I don’t know if having to keep lots of balls in the air is necessarily unique to being a woman artist – or maybe just being a woman in US society. But, wearing many hats simultaneously – mother, wife, artist, educator, employee – has always been a huge balancing act for me, even though I have been fortunate to have a good support system of family and friends. In response to my first answer above,…simply, I decide to turn a tough situation around in my favor by examining the problem and deciding how to change my work so it won’t attract labels that distract from my intentions. Did you ever feel like giving up? What’s the best piece of advice you’ve been given at the time? Of course I have. When a mold that took me 2+ weeks to construct cracked during a firing and $500 of molten glass puddled on my kiln floor….yes, I wanted to give up! Nevertheless it’s healthy and gives us pause to come face to face with failure because it forces us to reevaluate what we’re doing. An old adage; nothing new. But, in all honesty, I can’t imagine ever giving up on anything I care about. Plant your feet. Maintain your integrity. Nurture your passion. If at all possible, never allow a profit motive to get in the way of what you hold up as your art. I see them as vestiges of a tactile diary – encapsulations or expressions of specific stages in my development, psychologically as well as testaments to my technical know-how (skilled or not). I think it’s always interesting to reflect on what you found important at any given point in your life. A few months ago, you had an installation inspired by Thangka. Tell us about it. “Between Seeing and Knowing” is a large-scale installation created in collaboration with my good friend Nancy Cohen, a sculptor who works outside of New York City. The project was as an outgrowth of a residency we shared at the Corning Museum of Glass in 2012 and was inspired by our joint interest in Buddhist Thangka paintings. As installed in our recent show at the Accola Griefen Gallery in the Chelsea area of New York City, the wall and ceiling-mounted assemblage measured approx. 33’ long by 10” tall and was comprised of nearly 300 elements. Without replicating any one painting, the installation interprets in a much looser manner the structure, overall sensibility and individual component symbols used in the otherwise strictly hewed Buddhist examples we studied. My “dream project” is more of a “dream desire” to some day be afforded time to devote solely to my studio work with fewer distractions – but I think the distractions are just life and it’s all about how they’re managed anyway. What is up and coming for you? Currently, Nancy and I are working on plans to expand our installation project by seeking new show venues and residency opportunities. Relative to my own work, I’m enjoying a rare freedom from exhibition deadlines. Right now I’m in the process of finishing a number of unrelated glass pieces. The one I am most excited about involves casting “walking devices” that I will in turn use to make monoprints. With regard to my museum position, I am in the process of curating several exhibitions of artists who use glass along with organizing a major glass auction event for the fall. 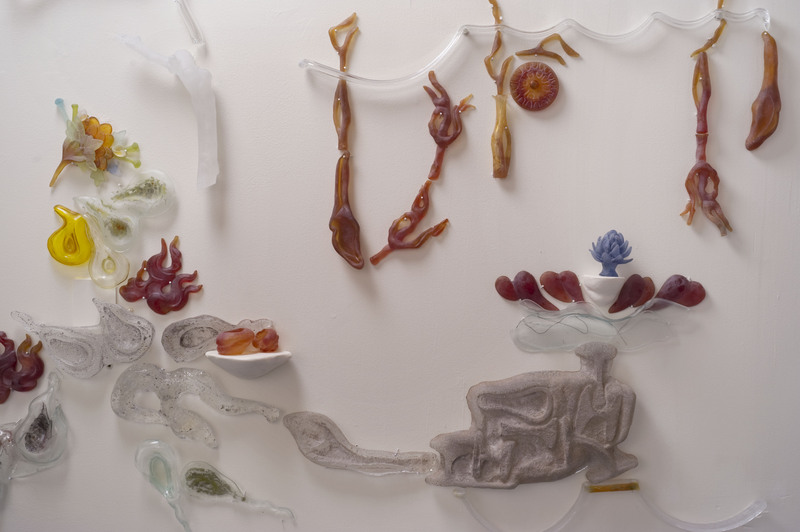 This entry was posted in Interviews and tagged Anna, Anna Boothe, BFA, Boothe, Brain Child, Decorator, Director, Glass, Glass at the National Liberty Museum, IFWA, Illustrator, International Foundation of Women Artists, INTERVIEW, MFA, Philadelphia, Sculptor. Bookmark the permalink. wonderful interview! very interesting to read about this artist who I have always had a great deal of admiration for!